This article by Edward Leigh of Smarter Cambridge Transport was originally published in Local Transport Today (25 May 2018, subscription required). “You can never have too much government,” said no-one ever. Yet Cambridgeshire is groaning under the weight of local government. There’s a county, unitary, five district, and 260 town and parish councils. A LEP [Local Enterprise Partnership] was formed in 2010, the Greater Cambridge Partnership (GCP) of Cambridge and South Cambridgeshire in 2014, and a mayoral combined authority in 2017. The LEP is being resurrected as a business board within the Combined Authority after it was wound up following a National Audit Office investigation. Five of those bodies have responsibilities and receive funding for transport: the two highway authorities; the LEP, with £150m of Local Growth Deal funding; GCP with a £500m City Deal; and the combined authority, with £20m/year plus £74m of Transforming Cities funding and more grants anticipated. The Combined Authority has statutory responsibility for developing a Local Transport Plan and is drawing up a county-wide Transport Delivery Plan. It will soon control almost all income to the highway authorities and the LEP, but not GCP – and this is where it gets interesting. The Conservative mayor, James Palmer, won considerable support from Cambridge voters by backing a proposal for an extensive light rail network. That proposal, developed by some local residents under the name Cambridge Connect, includes up to 180km of track and two twin-bore tunnels under the city. However the mayor and GCP are now backing something called Cambridgeshire Autonomous Metro (CAM), but don’t seem to agree on what it is. CAM emerged from a Mass Transit Options Appraisal report commissioned from Steer Davies Gleave (SDG). Costing £153k, the report was meant to settle a long-running debate about the relative merits of light rail versus bus rapid transit. It didn’t, mainly because it evaluated different modes on the basis of completely different network geographies. It concluded that the mass transit solution most likely to be viable for Greater Cambridge is a rubber-wheeled, articulated ‘tram’, probably guided optically along asphalt roads, segregated where possible, and, in time, driverless. The mayor took this as an endorsing his commitment to light rail, believing CAM to be much more like a tram than a bus. His Combined Authority accepted the report and agreed to commission a business case for CAM at a further cost of £600k. There is also contention over Park & Ride. This has been a key transport strategy for Cambridge since 1996, with five sites built around the city, and two along the St Ives busway. GCP has plans to build four more, but the mayor is blocking them. He has no wish to invest £1.5bn or so in an extensive ‘metro’, only to have people continue to drive to a free car park on the edge of the city. 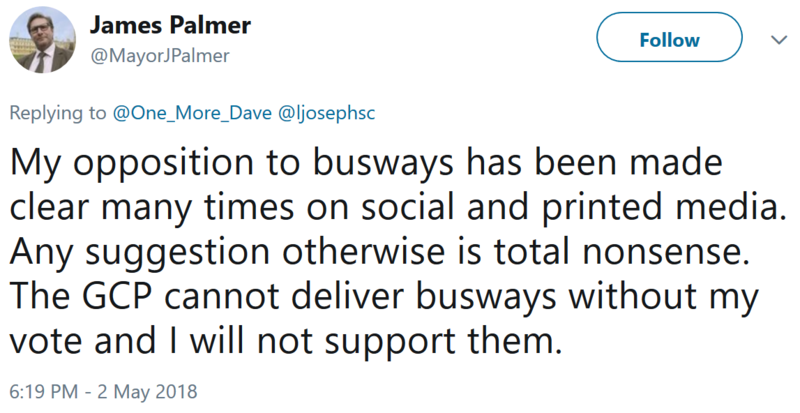 On this the mayor is right, as Prof Graham Parkhurst and others have shown: P&R abstracts passengers from rural public transport, perpetuates car dependency, and exacerbates congestion in necklace villages. Now that P&R parking is again free (i.e. subsidised to the tune of £1.2m by the taxpayer), these effects will be compounded. Smarter Cambridge Transport is promoting instead ‘travel hubs’ – smaller-scale transport interchanges between express buses or trains and a variety of local transport connections, including safe walking and cycling links; feeder, demand responsive and community bus services; kiss-and-ride; and limited, paid-for parking. Travel hubs need to be an asset to the local community, with amenities (e.g. lighting, shelter, toilets, water and power) to support activities like markets and mobile services, such as the county library and health screening. The mayor and GCP have embraced the principle. Disappointingly though, initial proposals from consultants Skanska are essentially just plans of car parks in mostly poorly-connected locations. The railway too is attracting attention and investment, but the mayor has expressed anger at the frustratingly long timescales and enormous costs. With Cambridge North station now open, plans are being made for a new station to serve the Biomedical Campus, which in 2019 will be drawing 34,500 people on site each week day. However, delivery will be complex and Network Rail claims the timetable rules out any interim solution. There’s a strong case for adding a further five stations to the existing local rail network, some of which may be enabled by East West Rail. Reopening the Wisbech branch line is also on the mayor’s agenda. The mayor’s most developed ambitions though are for the strategic and major road network: dualling the A47 between Peterborough and Great Yarmouth; dualling the A10 between Cambridge and Littleport; and extending the M11 north to between Peterborough and Wisbech. Besides concerns about induced demand, sequencing will be critically important: the business case for investing in heavy rail or the ‘metro’ will be very much weaker if funding is allocated first to expanding road capacity. The stakes are high, with so much housing and employment growth in Greater Cambridge already committed to. There is political pressure and ambition to act boldly. Money is available. But a coherent vision and strategy are lacking. Will the mayor succeed in delivering an extensive ‘metro’, and what will run on it? Will he overcome the Sisyphean GRIP [Governance for Railway Investment Projects] to squeeze untapped potential from the existing rail network? Will he use the Bus Services Act to fix the many flaws in the existing bus network and services? Or will his lasting legacy be a large expansion in road capacity?